Please follow signs to the parking areas in the Recreation ground at the Oxford end of the village and/or ‘Abbey View’ to the South. Abbey view tends to be used only when the weather is dry. Abingdon Road, High Street and Henley Road are the bus route through the village and must be kept clear at all times so that the buses can pass. Please do not park your vehicles where they may prevent the passage of emergency vehicles. 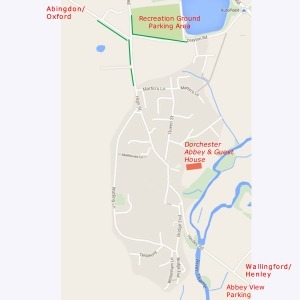 There are a limited number of disabled parking spaces available and some within the Abbey grounds which can which can be booked – please telephone our box office to make arrangements for these.